Collectors don’t need to fear this reaper… or do they? 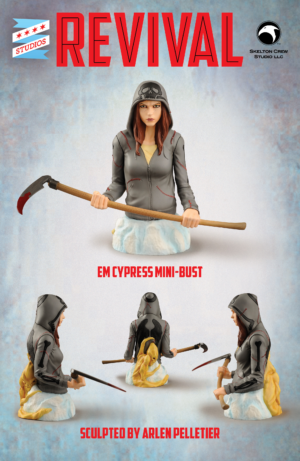 Litchfield, ME — Skelton Crew Studio, a comic book replica studio based in the wilds of Maine, has collaborated with “Revival” creators Tim Seeley and Mike Norton on new collectible statue based on one of the series’ main characters, Em Cypress. This officially licensed limited edition mini-bust stands 6-inches tall and features Em in her classic, amazingly detailed hoodie, clutching a bloody scythe, with a creep sneaking up her back. As a bonus, fans who pre-order by Feb. 14 will receive an Em Cypress toe tag, signed by both creators. Em was designed by Mike Norton and studio head Israel Skelton and beautifully sculpted by Arlen Pelletier. Skelton Crew Studio has been making busts since 2014, when the studio debuted the Poyo bust for “CHEW,” but this is its first work with Seeley and Norton. The statues comes hot on the tails of the “Revival” team’s announcement that a movie based on the comic is currently in production by Shatterglass Films.